Planned Parenthood Upset, New Judges Confirmed! Planned Parenthood is desperately trying to fight back at the State Capitol against pro-life progress. Click to see an email they sent out yesterday. 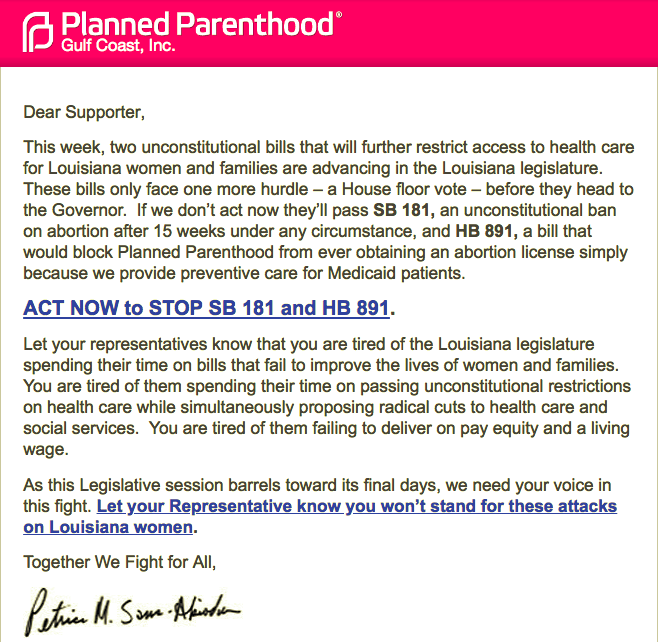 Email your State Rep now to support two pro-life bills, one of which (SB 181) will be considered in the House today! Some good news: both attorney Kyle Duncan and Judge Kurt Englehardt have been confirmed by the U.S. Senate to the 5th Circuit Court of Appeals! This is a win for the cause of life. We appreciate Senators Cassidy and Kennedy voting for both judges. P.S. Our friends in Winnfield will host the " Chuck Weeks Memorial 5K Run/Walk " coming up on May 26 to honor the memory of Chuck Weeks and support the cause of life. Please make it if you can! Foster Care is Important to the Pro-Life Cause! 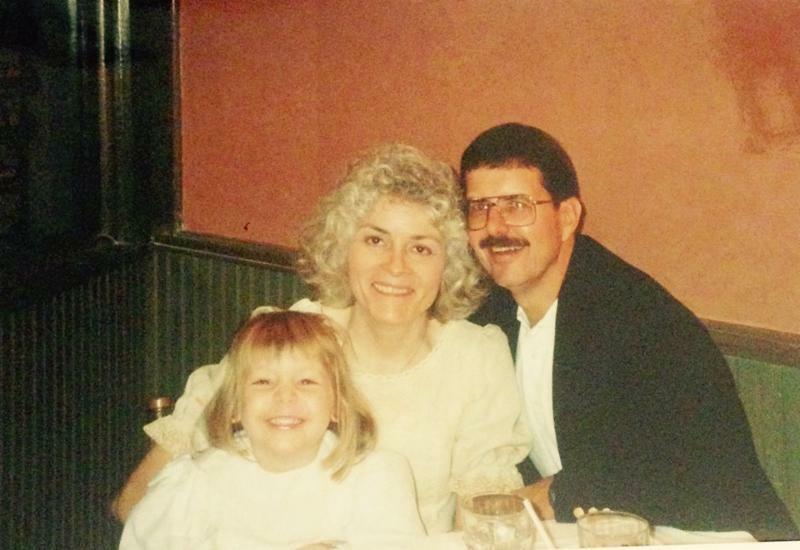 Sarah is shown with her foster and later adoptive parents, Bobbie and Ronald Jones. May is National Foster Care Awareness Month, and who better to advocate for foster care and adoption than a former foster child herself! 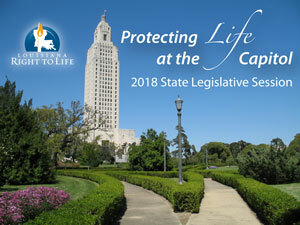 Louisiana Right to Life team member Sarah Zagorski has a new website advocating for life, foster care, and adoption. She has a remarkable story of being rescued from abortion and then adopted after nearly eight years in foster care. Visit her website at www.SarahZagorski.com. Louisiana Right to Life's 2018 flagship legislation, "the Adoption Option Act" (HB449), and two other pro-life bills have been been approved by both the House and Senate and sent to the governor for his signature. Several other bills are close to final passage as the 2018 Legislative session begins to wind down. High school and college students, journey with us through the human issues of abortion, adoption, foster care, human trafficking, euthanasia, pro-life feminism, disability discrimination, bioethics, and more at the 2018 PULSE Leadership Institute in Baton Rouge June 18-22.Sign up today and reserve your place! Spots will be filling up fast, so register now! Nearly 10,000 diapers were donated to local families in need thanks to you! The second annual Poo-Dat Diaper Drive, conducted at Robert's Fresh Market locations in the New Orleans and Baton Rouge areas, netted 9,722 diapers . A big THANK YOU goes out to all of you who donated. Next year's drive is set for April 3-9. Mark you calendars! 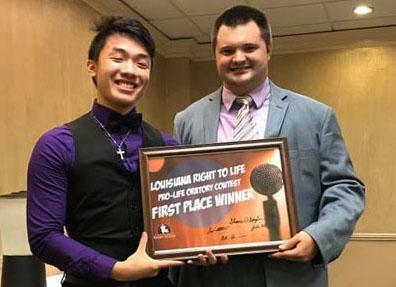 Congratulations to Henry Nguyen of Lafayette, the 2018 Louisiana Right to Life Pro-Life Oratory contest winner. Nguyen and others competed for the award earlier this month during the Knights of Columbus state convention. He will now represent Louisiana at the National Pro-Life Oratory Contest in June. 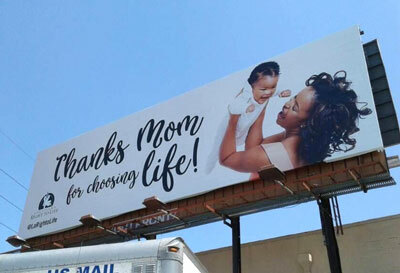 This Mother's Day billboard is one of three up this month in the greater New Orleans area. This is part of a year-long campaign by Louisiana Right to Life and New Orleans Right to Life aimed at spreading a consistent pro-life message. Are you interested in bringing the message to your area? Check out the link below. Pro-life citizens in Sabine Parish honored mothers in a special way Sunday, marching through the streets of Many. 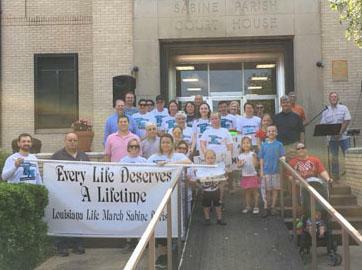 Louisiana Right to Life team member Brian Gunter joined the group in the first-ever Sabine Parish Life March. Thank You for Marching for Life! 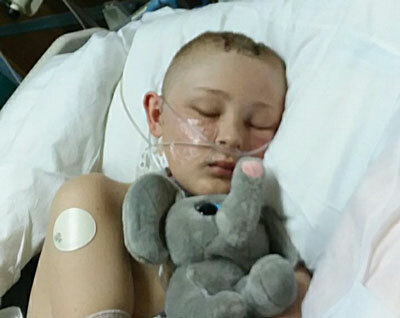 Did you hear about the Alabama boy who came back to life after his parents signed papers to donate his organs? It's a great reminder that, while organ donation is a good thing, we must make sure we aren't prematurely ending a life for that purpose.